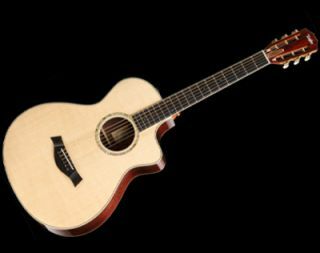 PRESS RELEASE: Taylor Guitars is proud to debut an inspiring new acoustic voice, the 12-Fret, as one of several new Specialty guitars in the company's 2010 line-up. Named for the point where the neck meets the guitar's body, the 12-Fret revives an acoustic design concept from yesteryear, refining it with signature Taylor craftsmanship to deliver a sweet, warm, vintage sound with a surprisingly robust voice. The Grand Concert body features a back and sides of beautiful Indian rosewood and is complemented by a creamy Sitka spruce top, and a cutaway that allows access to the upper register. Premium appointments include Ivoroid binding, an abalone rosette with an Ivoroid-bound soundhole, and abalone-dotted ebony bridge pins. The mahogany neck features a 24 7/8-inch scale length topped with a slotted peghead and crowned with Indian rosewood. On the inside, the guitar's voicing is enhanced by a special 12-Fret bracing pattern andTaylor's Expression System pickup to naturally amplify the guitar's rich tonal nuances. The 12-Fret guitar joins the Baritone 8 and 6-String models, announced earlier this year, as part of the company's series of Specialty guitars. The new guitar will be offered at a suggested retail price of $3,898 and will be available at both domestic and international dealers in late spring. For more information about the new 12-Fret from Taylor, click here.